840 South Indian Hill Blvd. Casual meet and greet in the conference room just off the main Tennis court. We had a mini conformation training class to help those who were new to the ring. This a great way to start the weekend activities. This year we had a special treat for our Meet and Greet. 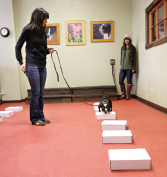 Ramona Audette from the California Academy of Dog Behavior conducted a basic Nose Work class. Pizza was brought in for a casual dinner after the class. The guest judge, Marianne Schlüter of Kennel My Bonnie (Denmark), evaluated each dog during the competition. Written critiques were issued to all participants. These critique are displayed on the Members Only section of the DSFCA Web site along with the past four Specialty critiques. Evening dinner presentation was by our guest judge, Marianne Schlüter from Denmark. The Annual meeting was held Sunday Morning before the Shows in the hotel conference room. Minutes of the meeting are posted on the Member's Only Website. For those who have traveled to Denmark you will be able to share with the rest of us what a wonderful person and authority on the Farmdog Marianne is. Marianne is doing this for us at a great hardship to herself, she is deathly afraid of flying. To help her, Niels her husband will accompany her. We hope everyone will make a added effort to join us at this show, her breeding expertise of the Farmdog is more than 25 years in the making. You have questions about breeding she will be the one to help. As much as we all would have liked to shown off our dogs to Ole Staunskaer, Marianne Schlüter is a real gift to us. At Marianne's, I found Pingo was a true gentleman…just like his son, though quite a bit smaller. In dog speak, Pingo conveyed his greetings to his other offspring with Annika (Skoen's siblings): Lexie, Disa and Frisco. Marianne's other DSFs were fantastic too. Marianne's DSF family includes: My Bonnie (M.B.) Indyana Jones, M.B. Bikini Badenymfe, M.B. Bodille Babysitter, M.B. Forsøde Fine Freja, M.B. Calorius, Alfred, M.B. Burgerking Medium, M.B. Oh Mein Papa = Pingo, Orestadens Yndige Zora, Kitenga Ello Exxon, Sputnik's Frida, M.B. Gibbernakker og Krubbes Mirakulix, M.B. Duksedreng i Drejlsklæder. Plus Thor, a pointer. And it's not just dogs; Marianne and Niels have a very fertile farm. Along with Pingo, I met their pregnant mare, baby ducks, kittens, and more. We were all very happy to have Marianne Schlüter join us this year!